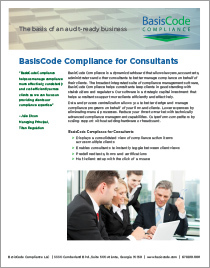 Atlanta, GA. – October 27, 2015 – BasisCode Compliance today announced a new version of its software developed specifically for compliance consultants. BasisCode Compliance is the industry’s broadest integrated compliance software platform for asset managers, advisors and other financial services firm. The new software helps attorneys, auditors, fund administrators, accountants and other consultants more easily manage compliance on behalf of their clients. Enhanced to ease multi-client setup, the BasisCode Compliance™ software centralizes compliance task management, from testing and risk assessment to personal trading and certifications—all within a single platform. The BasisCode Dashboard displays a consolidated view of action items, enabling consultants to easily analyze and oversee compliance activities across clients. The BasisCode Portal allows consultants to instantly toggle between client views. In April 2015, fund services provider SEI (NASDAQ:SEIC) announced the selection of BasisCode Compliance to centralize management of internal and outsourced compliance functions on behalf of their clients. This was the first implementation of BasisCode Compliance for consultants. Titan Regulation has also chosen BasisCode Compliance to standardize and enhance compliance processing across the Chicago-based consultant’s clients. In May, BasisCode Compliance was named a finalist in the compliance technology category of WealthManagement.com’s 2015 Industry Awards, the first program to honor outstanding achievements by companies that help advisors better manage their businesses through innovation, enhanced service quality or an enriched advisor/client experience. BasisCode Compliance offers the industry’s broadest set of integrated software that improves compliance management for asset managers, investment advisors, broker/dealers, insurance companies and other financial services providers. 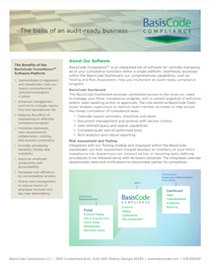 The intuitive BasisCode Compliance software spans functionality, from testing and risk assessment to personal trading and certifications, enhancing compliance controls and decision-making for financial services firms and their clients. 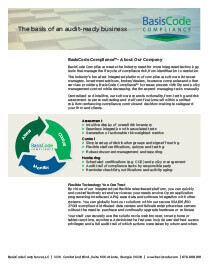 For more information about BasisCode Compliance, visit www.basiscode.com. Titan Regulation is a premier provider of compliance solutions for the financial services industry. Our mission is to inform, prepare and protect our clients in today’s challenging regulatory environment through leading-edge research, proprietary processes, and relationship-based service. To learn more about how Titan Regulation can help you protect your business with current and efficient compliance processes, visit www.titanregulation.com.